In 2014, we established our office in the German capital. With Berlin being the heart of Germany’s venture and digital business scene, our clients are not only international and domestic companies but also foreign investors as well as entrepreneurs. Our lawyers represent corporate clients, listed companies and private equity sponsors in the full range of M&A transactions, corporate reorganizations and other corporate law matters. Our Berlin office also focuses on employment advice on all employment and labour law matters. Additionally, our Berlin office provides notarial services. Our lawyers have comprehensive industry knowledge in the fields of consumer, telecommunications, IT, retail and media and technology. With 66 offices worldwide, our practice groups cooperate closely with each other. We provide clients with the full resources of a global firm from a single, local point of contact. With our innovation-orientated approach, we can help our clients with an individual solution where needed. Exit the A24 motorway at the "Havelland" interchange and enter the A10 towards Berlin. At the "Oranienburg" interchange, take the A111 motorway towards the centre ("Berlin Zentrum"). Follow the signs towards "Zentrum" (driving past the ICC) and take the exit "Kurfürstendamm/Zentrum". Continue along Kurfürstendamm and then turn left onto Joachimstaler Straße and then left again at the next junction onto Kantstraße. You will find our office inside the "Neues Kranzler Eck" building complex. At the "Drewitz" interchange, take the A115 motorway (also referred to as AVUS) and follow the signs towards the centre (direction: "Zentrum"). Continue along Kurfürstendamm and then turn left onto Joachimstaler Straße and then left again at the next junction onto Kantstraße. You will find our office inside the "Neues Kranzler Eck" building complex. At the "Schönefeld" junction, take the A10 and then, at the "Drewitz" interchange, the A115 motorway (also referred to as AVUS) and follow the signs towards the "Zentrum" (city centre). Continue along Kurfürstendamm and then turn left onto Joachimstaler Straße and then left again at the next junction onto Kantstraße. You will find our office inside the "Neues Kranzler Eck" building complex. Please take the suburban train S 5 (towards Spandau), S 7 (towards Potsdam Hauptbahnhof) or S 75 (towards Westkreuz) and exit at Zoologischer Garten. Our office is located within walking distance (approx. 450 metres) from the station. Alternatively, you could take the U9 underground train and get of at the next stop (Kurfürstendamm). Our office is located within walking distance (approx. 100 metres) from the underground station. You will find our office inside the "Neues Kranzler Eck" building complex. Please take a taxi from the airport to "Kurfürstendamm 22" (travelling time approx. 15 - 20 minutes depending on the traffic). Alternatively, the 109 bus will take you from the airport to "Kurfürstendamm" underground station. Our office is located within walking distance (approx. 100 metres) from the bus stop. 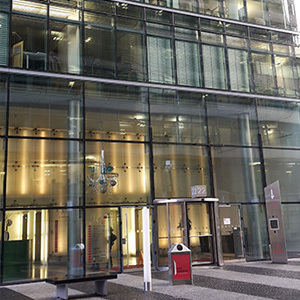 You will find our office inside the "Neues Kranzler Eck" building complex.